I don’t usually feel guilty when I don’t finish a book. But I do when it’s a classic that I know people love, and North and South is one of those. So I was happy to hear about this readalong hosted by Estella’s Revenge and Capricious Reader. Just the kick I needed to pick it back up. This week we’re discussing chapters 1-14. Here’s a quick overview of the story, which was published in 1855 by Elizabeth Gaskell. Margaret Hale is a young woman living in a country town in Southern England. Her father is the pastor at Helstone, which I find a humorous name because Helstone is this ideal place to live where the birds sing and the flowers bloom. Margaret’s family, like a lot of Austen families, are of the “gentle” class but still struggle financially. Margaret is smart and cares for her family. She’s not a rule-breaker by any stretch but is definitely her own person. She is disdainful of people in trades or industry, although sailors and farmers are just fine with her because they work off the land. In the beginning of the book, Gaskell contrasts the busy society life of London with the quiet pastoral life of Helstone. But there’s another contrast in the wings. Mr. Hale makes a decision that forces the family to move north, to the industrial town of Milton. The family is now low on funds, zero on reputation, and forced to live among factory workers (although they are in a four bedroom house with two servants). Mr. Hale is hired as a personal tutor to Mr. Thornton, the thirty-something factory owner, a self-made man. Sparks fly – or thud – when Margaret meets Mr. Thornton and they have no idea what to say to each other. He thinks her haughty and she sees him as “a tradesman”. But this is an overly simplistic description, and what’s nice about this book is the complexity of the issues. Clearly Mr. Thornton has merits as a hard-working, honest man. On the other hand, Gaskell is clearly raising issues regarding the abusive conditions of factory work. Margaret isn’t guilty of all the snobbishness that Mr. Thornton perceives – but she’s no saint either. At this point in the story Margaret is really holding her whole family together. She has a brother who is “missing” (we find out more later), and her father and mother are self-absorbed and dependent. Mr. Hale throws the whole family into turmoil yet all he can do is whine and complain about it. He decides the whole family has to move, then waits until the last minute to tell Margaret – and then he makes Margaret tell her mother. I was kind of feeling sorry for Margaret at this point, but then she meets some of the factory workers, and you realize how little she has to complain about. She lives a pretty idle life when she isn’t propping up her parents, and she doesn’t really try that hard to help the less fortunate. So far I’m really enjoying the book. I find Gaskell’s style straightforward and easy to read. I especially likes how much attention she pays to conversation, contrasting what the characters are thinking with what the other characters perceive. 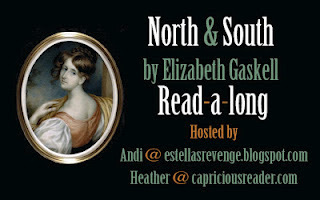 That’s part 1 of 4 for the North and South Read-Along. If you’re part of the Read-Along, let me know how you’re liking the book. NPR’s Best-Ever Teen Novels List: What’s a Teen Novel Anyway? I love reading North and South. Also, I like the BBC mini series. I haven’t read the book yet, but I’ve seen the bbc tv mini series North & South (2004). It was amazing. When you read your book you can check it out. Glad you weighed in with your thoughts! I’m just now getting caught up to where we were last week, and since I’m not bound to teach/grade for any online classes until the 20th of this month, I’ll have some time to do some focused reading and hopefully catch up on the next update this weekend. So far I adore Thorton, and Margaret is a bit up in the air. I am enjoying the contrasts in lifestyle and class a great deal. Can’t wait to get home from work today and dive in! I loved North and South – read it twice since stumbling upon it two years back. Then I found the adaptation on BBC – loved that two. I like how the Margaret slowly realises her true feelings towards Thornton, and how the latter tries to suppress his after Margaret turns him down. Kids should be reading this book! Can’t wait to read this again.